Weekly Courses in acting, dance & performing arts. Enrolments have begun for our next season beginning September 2018. Please download the appropriate course schedule below to see all our classes before booking on our online portal. Scroll down to find out about our drama, dance and performing arts courses. Find out about our exciting holiday camps in Versoix, Etoy & Zurich. At Simply Theatre our intent is to enrich lives and brighten futures so that our students can be happy and reach their potential in the modern world. We do this through our professional courses in Drama, Performing Arts and Dance -that build skills, as well as our caring approach and environment that build confidence and lasting friendships. At the end of the year all of our students will perform in a ‘showcase’ for friends and family. This offers a performance opportunity in a professional setting and the chance to put into practice the skills developed over the year, and the chance for parents to see some of the material students have been working on in class over the course of the year. We have a specially designed rolling curriculum across all age groups and course types. Each year, our choice of material, genre and focus changes, allowing students to spend three terms exploring and developing a specific set of new skills and experiences, and realise them through performance. We believe strongly that the positive experiences which we enjoy as children are those which we become passionate about in life. Therefore, ‘fun’ is the key word for our Academy ‘Mini Dramas’. By using a game-based structure for training and exploration, we teach both theatre skills and the life skills that arise from working as part of a team. In particular, we work to develop acceptance, imagination and spontaneity, self-expression, observation, listening and the ability to work together. We also work with the children to create a safe environment in which to help each other make choices and express thoughts and opinions within the group with growing confidence. By using their ideas in a constructive way, as part of storytelling, we enable children to become aware of the potential of the mind and their own imaginations. Building on the skills developed in our "Mini Dramas" groups, students now begin to explore the role of the voice and body in acting, as well as continuing to use theatre games, exercises and scenarios to explore drama in order to enhance both their theatrical and social skills. The emphasis on play and fun is maintained, and they are also introduced to a variety of disciplines such as improvisation, movement, devising, text and characterisation. In particular, they begin to take responsibility for individual roles, whilst continuing to explore how to work together as part of a collective imagination. By age 7, students who have been with the Academy for at least one year now have the opportunity to apply to take the LAMDA examinations, with the backing of their teacher. By age 8, students are eligible to audition for some Academy productions during the year. In our Stage 2 Drama courses, students begin to engage in a more detailed way with character and situation. Their imaginations are stretched, and they learn how the voice and body can be used imaginatively and creatively to transform the actor into non-human forms. They work together to create new worlds, and begin to discover the potential of the actor to conjure magical stories from thin air. Further individual responsibility is offered, and they begin to engage more purposefully with dialogue. Throughout these new experiences, the Academy continues to ensure that work takes place in a secure, fun, respectful and playful environment, sustained by strong ensemble values. We also actively encourage students in Stage 2 to seek out and participate in as many performance opportunities as possible. In particular, they have the opportunity to audition for Academy productions. They also have the option to apply to take LAMDA acting examinations if they so wish. In addition to the skills developed on our Stage 2 drama course, students are introduced to techniques taught at the major accredited drama schools in the UK. Alongside continuing development of their improvisation, devising and text skills, students are introduced the techniques developed by various theatre practitioners, and apply them to contemporary and classical texts. Their work on individual roles begins to explore characters in more heightened, more emotionally challenging situations. They continue to explore the physical and imaginative potential of the actor. In particular, work on dialogue encourages bravery, spontaneity and freedom. We continue to nurture every student and offer them opportunities to engage with their own potential, supported by the ensemble, encouraged by their teachers and sustained by the laughter that fills our rehearsal rooms. Again, we actively encourage Stage 3 students to audition for as many productions as possible, as well as offering opportunities for LAMDA exams. 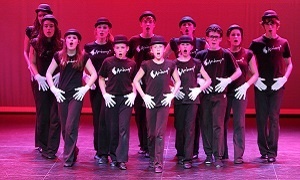 The Academy’s Performing Arts courses provide a wonderful opportunity for students wishing to explore the world of musical theatre and to receive all-round coaching, taking their performance skills to a more advanced level, in a fun, energetic and creative environment. This course provides comprehensive Musical Theatre tuition with each week’s 3-hour session split into three 55 minute sections. Students work with highly-experienced tutors on the core three disciplines of singing, dance and acting. A broad range of material is explored, taken from the very best of American and British musicals, past and present. At the end of the year, all Performing Arts students will perform in a special musical ‘showcase’ for friends and family. This offers a performance opportunity in a professional setting and the chance to put into practice the skills developed over the year. This also provides the chance for parents to see some of the material students have been working on in class over the course of the year. This course offers an introduction to the wonderful world of performing arts, with singing, dancing and acting, to children aged 4-6 years. The Academy’s courses in Ballet, Tap and Jazz provide a great opportunity for students wishing to explore the world of Dance and take their dance skills to a more advanced level. Our Dance courses provide comprehensive tuition each week and students work with highly experienced tutors exploring technique and choreography, increasing their dance vocabulary and expression through movement. We highly encourage students to make more than one genre in order to broaden their dance skills. If you have never done dance before, then your best starting point is to sign up for a Beginner's course in Modern, Tap or Ballet. Once you are ready, you will be then moved to the appropriate grade. Experienced dancers should contact us if they wish to be admitted to a more advanced level. © Simply Theatre Academy 2018.